Who's winning the space race — SpaceX or Blue Origin? 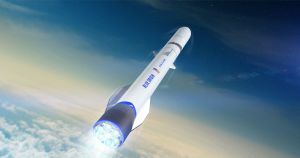 In a new animation, Amazon CEO Jeff Bezos’ space agency Blue Origin showed off a new design for its heavy load “New Glenn” rocket. The animation shows the two stage rocket take off from a launch pad before separating a bullet-shaped payload fairing in space as the booster re-enters the atmosphere and lands on a ship. Yes, that last part is similar to how SpaceX reuses its Falcon 9 boosters, down to the way legs (the Falcon 9 has four while the New Glenn will have six) splay out of the bottom of the booster to stabilize it during touchdown. While it’s not exactly a new idea — even for Blue Origin — a previous New Glenn animation from 2017 showed a slightly different leg design that folded out of the sides of the booster, rather than swinging out. In terms of specs, Blue Origin is promising that the New Glenn will be capable of delivering about 50 metric tons to low Earth orbit, while SpaceX’s Heavy Falcon will eventually be capable of delivering just over 70 tons. The New Glenn will stand 83 feet taller than the Heavy Falcon at a massive 313 feet (95 m) tall. Blue Origin’s smaller suborbital rocket, the “New Shepard,” has also made progress over the last few years. Its next test flight is slated for Jan. 23. Rather than sending a massive payload into orbit, New Shepard’s capsule will carry scientists and their equipment for experiments into suborbital space. We have yet to hear from Blue Origin about an exact launch date of its New Glenn orbital rocket, let alone crewed test flights. The company has said it’s aiming for a 2021 test flight from the Cape Canaveral Air Force Station. Blue Origin has some catching up to do. SpaceX’s Heavy Falcon completed its first test flight last February, becoming the most powerful rocket in operation.